It’s dinner time and you’re craving Thai! Thai cui­sine is famously cre­ative and var­ied. 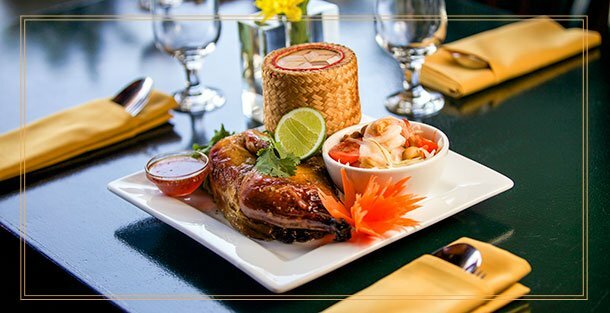 All Thai dishes strike a bal­ance between four flavours –sweet, sour, salty and spicy hot. We have an exten­sive menu for you to choose from. Begin your din­ing expe­ri­ence with great appe­tiz­ers. Try our veg­e­tar­ian spring rolls, healthy salad rolls, chicken wings with Thai dip, chicken satay (mar­i­nated chicken breast on bam­boo skew­ers), Cala­mari rings, crispy breaded Tiger prawns, crispy won­ton (a Chi­nese influ­ence with a Thai twist), tofu delight for veg­etable lovers or let­tuce wraps. Fol­low up your appe­tiz­ers with some soup. Try the famous Tom Yum Goong or spicy prawn soup or Tom Kha Gai, a chicken soup with coconut milk and Thai gin­ger (Galanga or Kha in Thai). Oth­er­wise, if you pre­fer, we also have a veg­etable soup, won­ton soup and a spicy noo­dle soup with egg, rice or glass noo­dles. So much to choose from! Have your soup with some salad, I-San style. Thai spicy sal­ads are all influ­enced by the cui­sine of north­east­ern Thai­land (I-San). We also have quite a vari­ety of spicy sal­ads, made from scratch! Order some­thing dif­fer­ent and share. It’s the Thai way of dining. The main course can be made up of cur­ries with rice (Jas­mine, coconut rice, gluti­nous or sticky rice) or Thai ver­mi­celli noo­dles. Be adven­tur­ous! We have veg­e­tar­ian dishes for veggi lovers, a vari­ety of stir fried dishes, as well as fried rice (pineap­ple, curry, Thai Cor­ner Spe­cial) and noodles. If you like spicy seafood, try our seafood specialties. Make din­ner time full of dis­tinc­tive flavours and com­ple­men­tary tex­tures, nutri­tion­ally bal­anced and delight­fully presented!